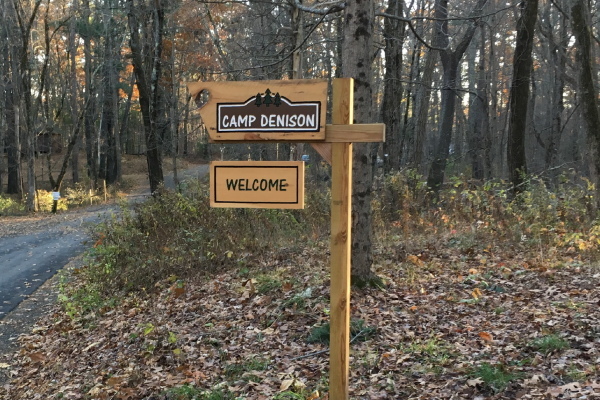 Camp Denison is forty-four acres of Town Conservation Land in Georgetown, MA. The Camp is open to the public during daylight hours to provide quality passive recreational and educational experiences at no charge. There are buildings to rent for birthday parties, non-profit fundraising, family gatherings, weddings and more. With several miles of trails there is scenery to enjoy, and explore in the summer, and snowshoeing in the winter. and the fish are always waiting, summer and winter. Educational programs, such as our collaboration with the Georgetown School system, summer programs with North Shore Nature Programs, and our Easter Egg Hunt and Family day programs are specifically designed for children. Come down and take a look, or explore using the links below. The Friends of Camp Denison are once again hosting its Annual Easter Egg Hunt, at the Robert Morehouse Lodge at Camp Denison, 84 Nelson Street Georgetown on Saturday April 20. Colorful candy filled plastic eggs will be hidden around the Lodge grounds. The Easter Bunny will be there to cheer you on. Pre-school, kindergarten and first grade are scheduled for 9:30. Second, Third, Fourth and up grades are scheduled for 11:00. A special area area will be set aside for preschoolers. Special prizes are waiting for the lucky hunters that find the golden eggs. So! come on down, SATURDAY, APRIL 20th!! The Friends of Camp Denison are once again raffling off two tickets to a Red Sox/Yankees game. The game is on Sunday September 8, and is the last Red Sox/Yankees game of the 2019 home season. In addition to the tickets, the winner will receive a limo ride to the park and back home again after the game. Great seats! Section 24, Box 141 third base side close to home plate.